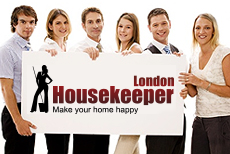 What if setting up your house cleaning service in London could be easy? What if you were guaranteed high-quality results by a hardworking, fully vetted team of maids? What if that team was completely insured? And were happy to help you out any day of the week - or at the weekend or even on bank holidays? That's what you'll get with Housekeeper London. Maid Services that are easy to book and free to reschedule with only 48 hours' notice. Services which fit in around your schedule with no messing around. Having a wide range of professional house cleaning services at your disposal, and specialist options for commercial cleaning too - it's easy to set up all of the work you need to be done in one short phone call. Full training and the use of the professional equipment sets the Housekeeper London team apart from the other companies. Get work you can count on, from a fully vetted and CRB-checked team - all provided under full insurance cover. I was very very very happy with the service. The 2 gentlemen you sent were very polite and informative. Did an outstanding job. More that I expected really. Very happy with the service and we use your regular cleaning service and are happy with that service as well. Fill in our Request a Quote form and get your free, no obligation estimate on the service you need. No minimum contract or deposit required! If you have any questions or special home improvement requests, please contact our friendly office staff on 020 3746 2485. The essence of our business is the quality with which we strive to amaze each of our clients. Moreover, this top quality can be obtained at extremely affordable rates.